I've had this lovely, drapey, indigo blue piece of pintuck fabric [PT-70225 from Diamond Textiles] for quite a while and finally got it made into something I can wear! made with pintuck cotton from Diamond Textiles. I used the Nine Lives Vest pattern from The Sewing Workshop. There are only four pattern pieces to this pattern—two fronts, a back and a collar. It's a fast and easy make. 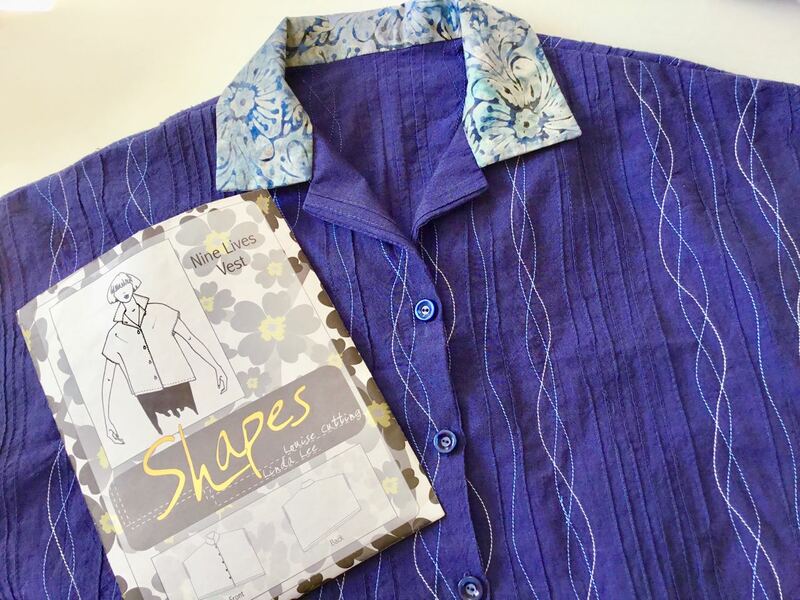 Nine Lives Vest: a Shapes pattern by Linda Lee and Louise Cutting. The Nine Lives top is airy, flowy, comfy and casual. The oversized bodice drops over the shoulders to create a short, cap-like sleeve. 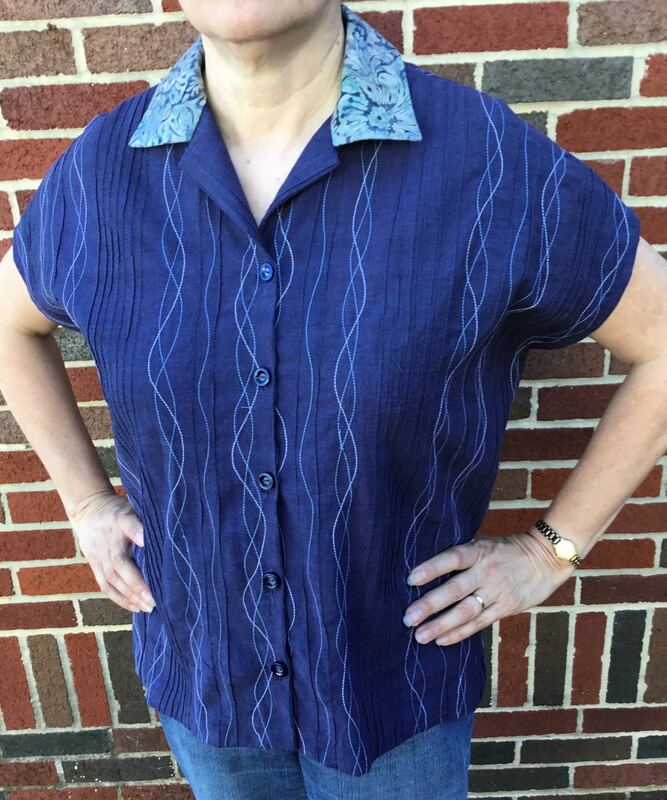 The original pattern has a slanted, asymmetrical hemline. 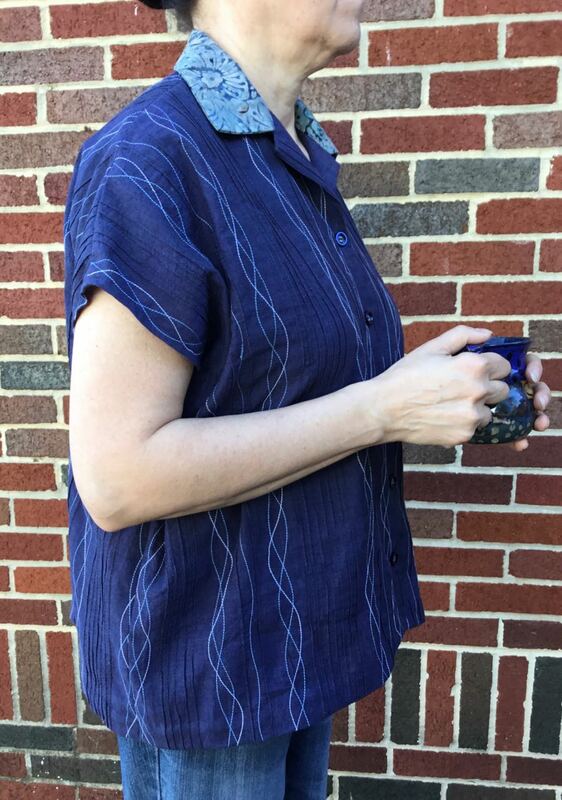 However, I decided to modify my version with a straight, symmetrical hem—shorter in the front and a little longer in the back. Nine Lives top, side view. The collar on my version is a batik from Majestic Batiks. This was a serendipitous addition during the construction process. 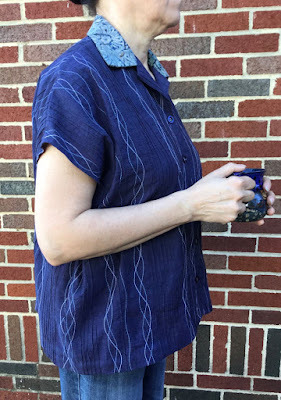 I think the print and the color of this batik works nicely with the decorative stitching and the indigo color of the pintuck fabric. The pintucks, decorative stitching and the contrasting collar are the stars of the show in my version. Nine Lives top, back view. The most difficult part of constructing this top was deciding the placement of the pintucks... and picking out the buttons from my button stash. I tape-baste the buttons in place for hand sewing. 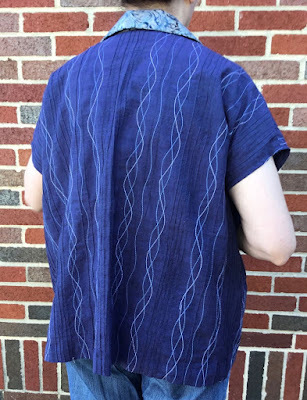 Give pintuck fabric a try with the Nine Lives Vest pattern. It's minimal work with a big impact. 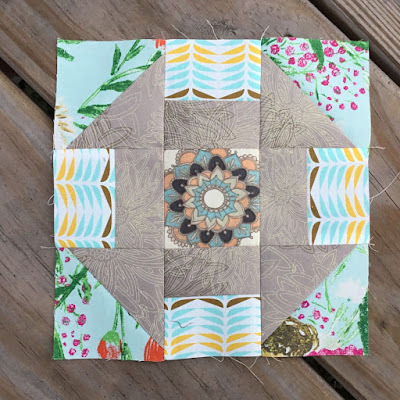 Since I'm skipping around in The Farmer's Wife sampler book and machine piecing the blocks with "easy math," I thought I'd add a bit of novelty to my blocks with selective fabric cutting—often called "fussy cutting." The Farmer's Wife Block 20: Churn Dash with fussy cut center. Fabrics from a Color Masters collection from Art Gallery Fabrics. 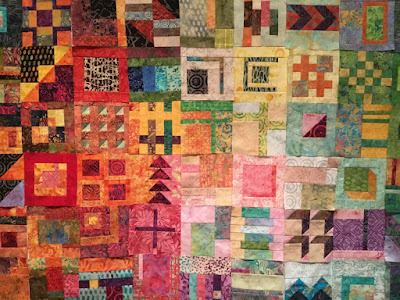 Selective cutting makes the patchwork process more interesting for the maker and the challenge of seeking out motifs in the fabric... or finding a good block to feature a motif... is really fun. The resulting quilt blocks are also more unique. Last week I talked to the very helpful folks at Heavenly Stitches quilt shop about fussy cutting units for my 6-inch Farmer's Wife blocks. They showed me two possible rulers and we decided the Creative Grids Square it Up and Fussy Cut ruler would be best for the small units that comprise 6-inch blocks. "Square it Up and Fussy Cut Ruler" from Creative Grids is a good tool for selective cutting. In examining the ruler, it’s fairly intuitive but instructions are included in the package. The ruler's lines and markings are easy to see and ruler worked like a champ. 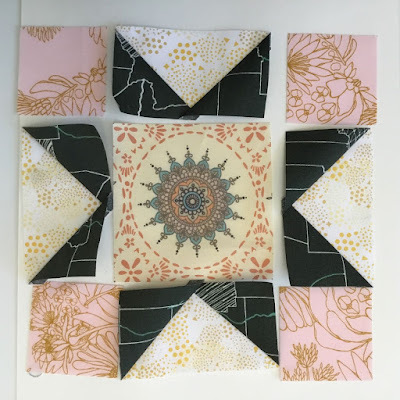 Creative Grids rulers also have those built-in "grippy circles" to keep the fabric from slipping during the cutting process, which, as it turns out, are also helpful when centering the ruler on the fabric motif and marking the corner points. 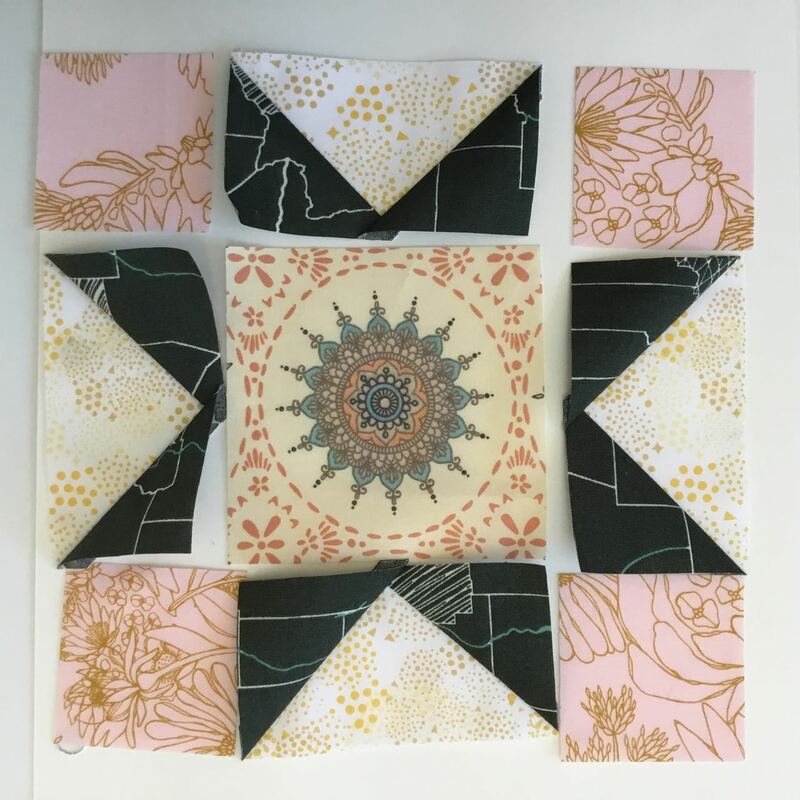 The Farmer's Wife Block 31: Evening Star with fussy cut center. Fabrics from Art Gallery Fabrics. Using this specialty ruler is much easier and the success rate is much higher than using a standard acrylic ruler for this technique. 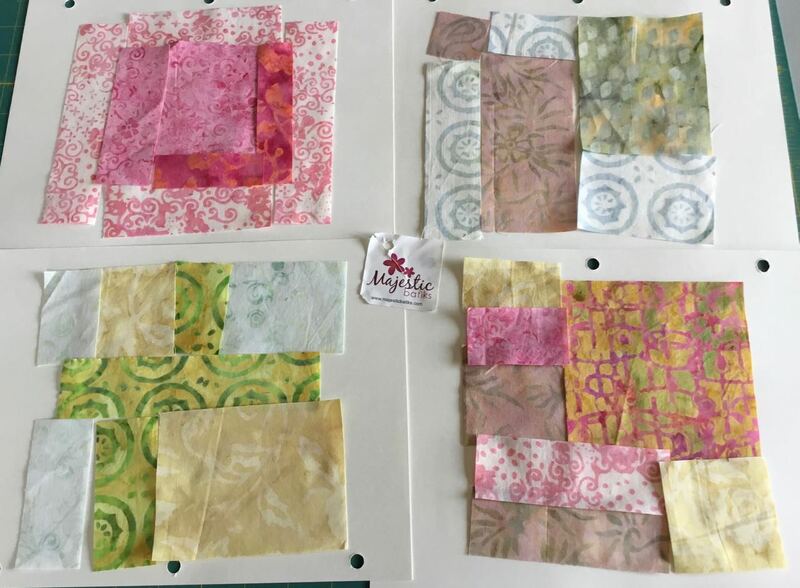 Contact YLQS (your local quilt shop) to get one of these great patchwork tools! The Evening Star block (above), with a fussy cut center, is next up for assembly. The guy that inspired "The Chef's Dilemma" quilt and I. It was 18 years ago today. "Vous et nul Autre" [You and no Other] altar cloth. This is the altar cloth that I created for our wedding—"Vous et nul Autre" [You and no Other]. 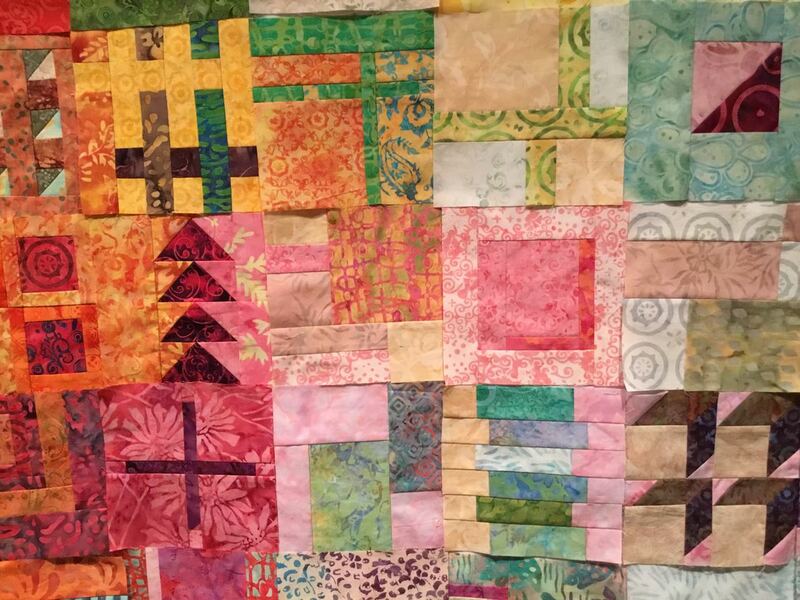 This art quilt was on the altar in the beautiful St. Jude Church in Chattanooga for our wedding ceremony and hung there until the liturgical season changed. Fr. Bob Hofstetter, the priest that married us and the pastor at the time, occasionally brought it back out and hung it in the church in February, around Valentine's Day. This quilt earned a first place ribbon at a regional quilt show and appeared in a feature article in PieceWork magazine (Sept/Oct 2003). It's now on permanent display at Good Shepherd Church in Newport, TN. 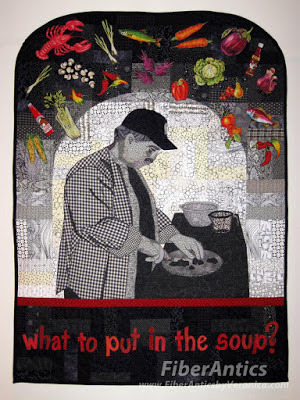 The background story about this quilt can be found here. Larry and I had a lovely wedding reception at the Tennessee Aquarium with our families and friends—some of which traveled great distances. We had a full course dinner prepared by an excellent chef, four cakes (yes, FOUR), music and dancing—including a special rendition of Take me out to the Ballgame. It was quite the celebration. but it doesn't feel like a long time. Just a few more days until the end of my 100Days100Blocks2018 journey. The sew-along started on July 7 and the last day is October 14. 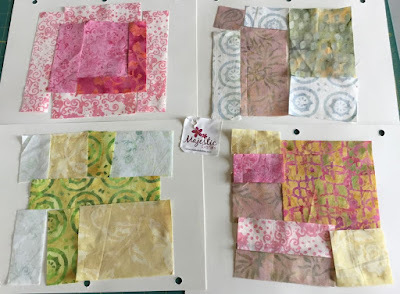 I'm using batiks from Majestic Batiks for all my blocks. After seeing all the blocks together on the design wall, I decided the last remaining blocks should have lighter values. 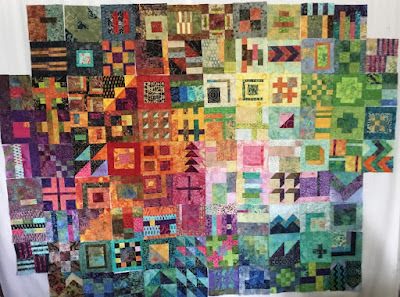 Here are the pieces for Blocks 97 - 100, laid out and ready for piecing. Blocks 97 - 100 ready for piecing. These last four blocks found their places among the others—beside the yellows, pinks, seafoam greens and the light aquas. Oranges, magenta, yellows, pinks. Merging from warm colors to light. City Sampler. 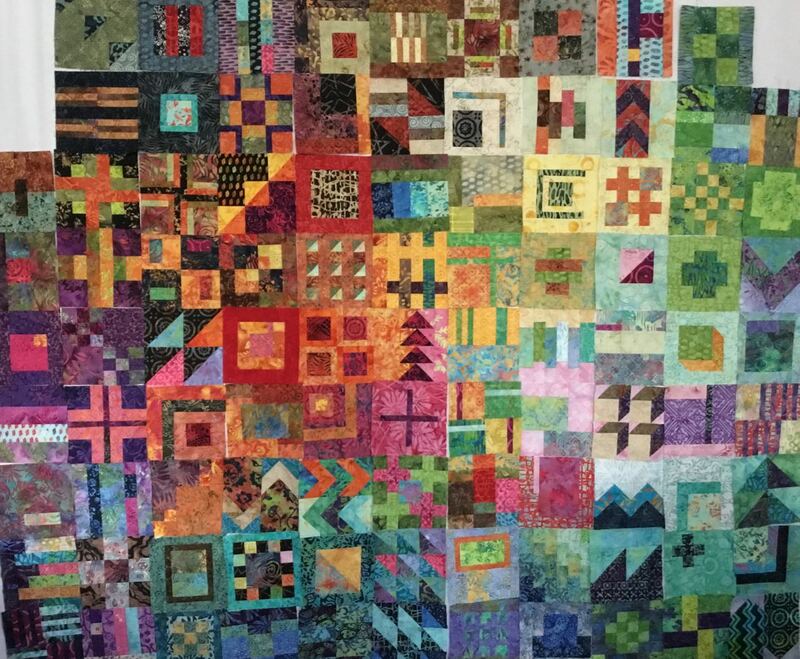 Blocks from the book, "100 Modern Quilt Blocks." 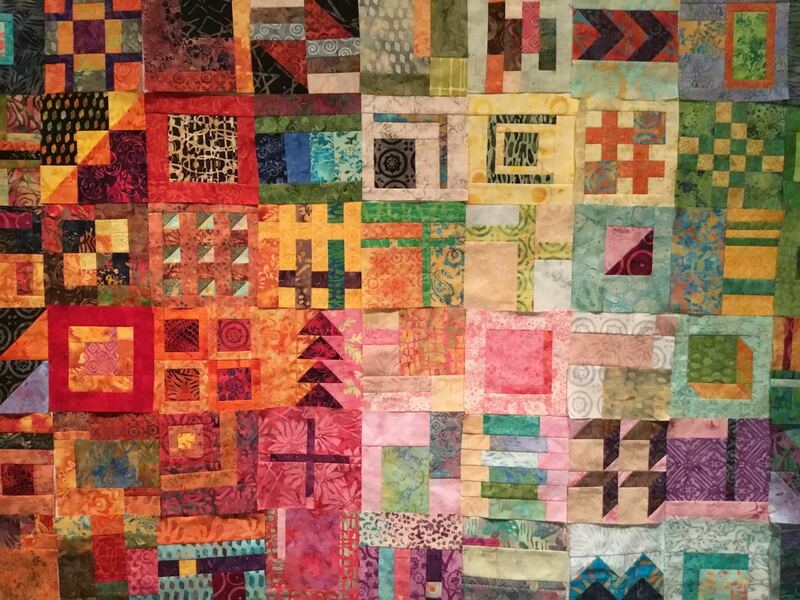 I am researching settings—sashing/no sashing/on point/alternate blocks—and deciding whether to put them into one quilt or several smaller quilts. The 100 Days of making blocks may soon be over, but there is more to be done.